These delightful muffins are perfect for an autumn breakfast! What does a mother do when it's raining and the temperature outside is in the mid-40's? 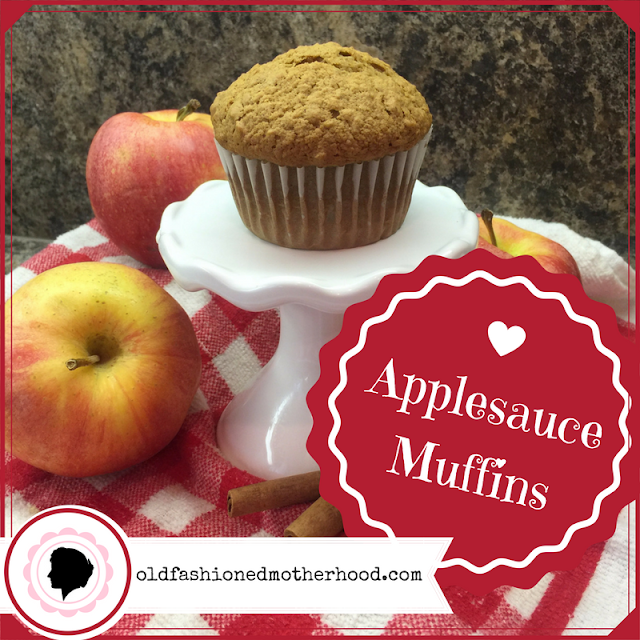 She bakes her babies applesauce muffins for breakfast! I found this delectable recipe online, but had to tweak it slightly for my family. Cream butter, shortening, and sugars together. Add eggs and vanilla; mix well. Add applesauce and stir until well incorporated. In a separate bowl, combine the remaining dry ingredients together. Add flour mixture to the wet ingredients until just combined. Line muffin tins with cupcake papers. Divide the batter evenly between 24 muffin cups, filling each one 3/4 of the way full. Bake for 25 minutes, or until a wooden tooth pick inserted in the center comes out clean.